The idea of forming a Yacht Club was first conceived by a group of charter members. To generate interest a sailing race was organized for August 1951. The wind did not attend, but many people did. Encouraged, the organizers arranged a meeting for November at the OK Landing United Church hall. With a good attendance it was quickly decided to form a yacht club, with Dr. Hugh Campbell Brown elected Commodore, Dr. Leon Causier Vice Commodore, Horace Gailbraith legal advisor, and Austin Collins as Secretary. Another thirty signed up as founding members, each contributing a few dollars, and June 23, 1953 the Vernon Yacht Club received its charter as a society. Meanwhile, the hunt was on for a waterfront club site. Debris from the paddlewheel era resulted in depressed values for the affected water front properties and in 1955, with the assistance of Dr. Campbell Brown, the club purchased one lot with a small building and 50 feet of lake frontage, directly across the road from the doctor’s then new house. 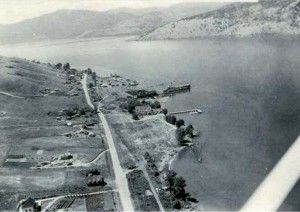 The Campbell Brown residence remains and the VYC is the only Okanagan yacht club to own its property. Before boats could enter the water from this lot, heavy equipment on a barge was recruited to begin pulling the forest of pilings, the Commodore and two other club dignitaries wading out chest deep to set the choker cable. Unfortunately, all other members were out of town that week. 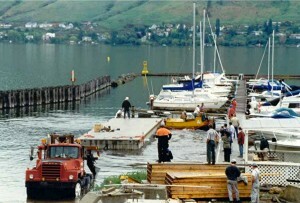 A launch ramp was built in 1956 and served the public and the club for several years. The following year the first clubhouse opened, funded by members purchasing 15 year debentures at 7%. 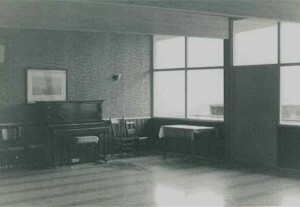 Built at water’s edge, the clubhouse had a stone fireplace and chimney and a verandah, which imitated a ship’s upper deck. The first Commodore’s Ball was held that year at the Allison Hotel ballroom and club records of the late 50s mention: many deadheads in the lake; midnight cruises on Charlie Holmes’ 50-ton float, “If you arrive late, stick around the launch ramp with your lights on and someone will come ashore to pick you up”, family cruises “with time for the children to swim before eating and have them home by 10:30 pm”; junior club formed; Ladies Auxiliary formed. 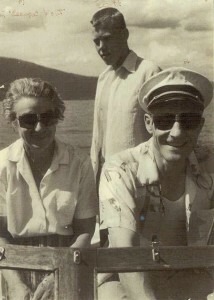 During the early 60s, the club held predicted log family cruises, hosted Girl Guides and the Spokane Outboard Club, assisted the Canadian Power Squadron to establish in the Okanagan, obtained a liquor license and assisted in having navigation lights installed at Rattlesnake and Cameron Points and at Grant/Whiskey Island. 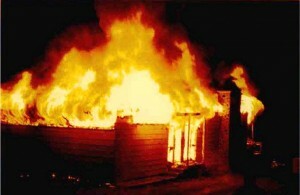 Then on February 14, 1967 there came an opportunity in disguise; the clubhouse burnt to the ground. Within 48 hours there were plans to rebuild, bigger and better for the future, using non-combustible concrete blocks. With much hard work by members the new building opened October 22, 1967. During the 1970s and annual fishing derby became popular, a world record 9lb 6oz Kokanee landed in 1988. Membership grew slowly, and by the early 1980s planning for an enlarged marina was underway. 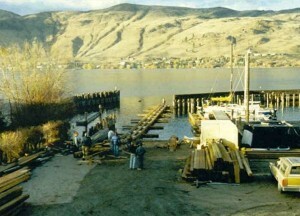 The waterfront lot to the west was purchased from a member and in 1987 work began on a major redesign and expansion of the marina. Members were assigned to highly organized work parties and slaved like the pyramid builders, the new marina opening in May 1988. 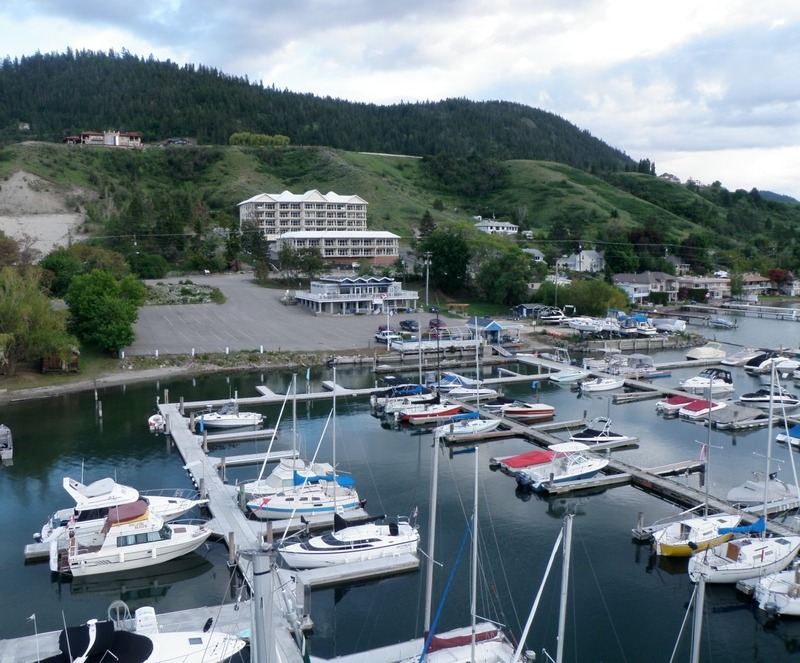 In 1989 the new marina became the sight of what was then the largest on water boat show in BC, organized by members and becoming an annual event. 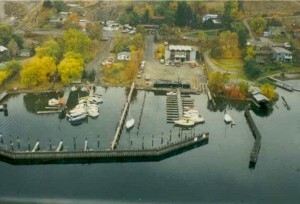 During the 1990s the number of sailboats increased steadily, two more of the adjacent lots were purchased and a further expansion in 1998 added moorage and a floating breakwater. Photographs of that period compare with those of the preparations for D-Day as eight 50 ton concrete cassions were formed and poured in the parking lot prior to being floated into place.